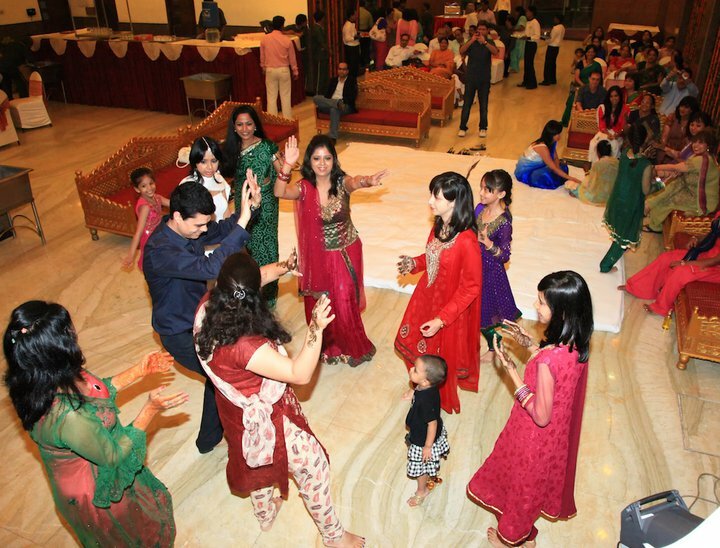 This is a pre-wedding Ceremony where the friends and relatives get together for some fun and dancing. Although, traditionally a rather North Indian tradition, it is more or less a popular feature at all Indian Weddings now. The Mehendi & Sangeet are more often than not combined as a single event. It is organized a day or so before the wedding. This is a much awaited and planned event with special dance performances/skits organized by the immediate family. It could happen at a hotel or a community hall depending on the budget and preference of the families. This is supposedly held in the bride and groom’s place separately. Though in the recent past, we’ve witnessed a combined Sangeet too. The bride’s friends and family play the dhol or the long tabla where songs are sung to tease the groom and his family. Elders of the family sing traditional songs and bless the bride for a happy wedded life. The bride is well pampered during this, as she steps into her new phase of life. Some have different ceremonies clubbed with this ceremony. Chuda or bangle ceremony may be held along with this function. In this ceremony, all the women are presented with different bangles of their choice. This is followed by a lavish dinner. It often goes live till the early hours of next day. Nowadays, this is often combined with a cocktail party too. Special Choreographers, DJs, Tarod Card Readers are hired to make the event a memorable one. Traditionally, Sangeet would be a ladies function with the ladies and the young girls from both the bride and the groom’s side.